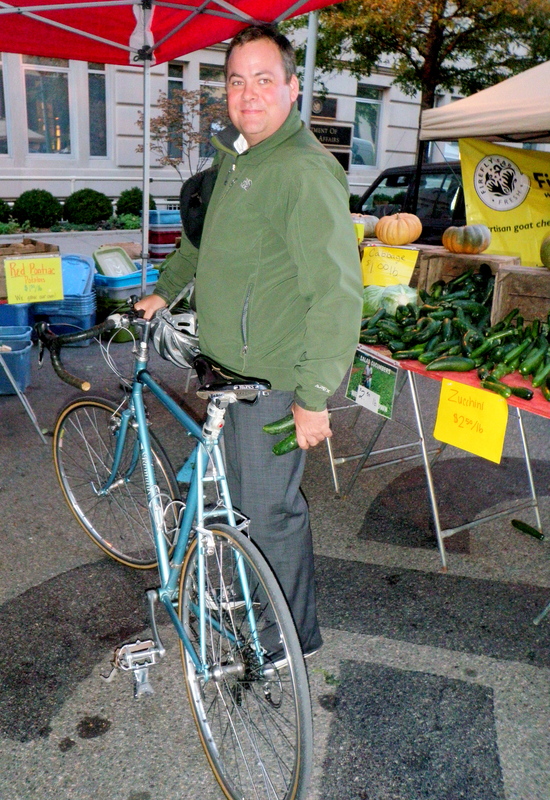 My stop by the White House farmers’ market today proved particularly fruitful, not only in terms of the apples I bought, but also because of the bike I ended up spotting. First, the fruit. Spring Valley Farms stocked me up on apples, and I got to pester chat with the staff about my recent bike tour. Our tour took Felkerino and me through Romney, West Virginia, which is the home of Spring Valley Farms. Twice a week, these guys make the two-and-a-half hour trek (by car, of course) from the idyllic cycling country of quiet West Virginia roads into Washington, D.C. It’s a hike, but I’m glad they do it because I like their produce. And it’s fun to talk about the area around Romney. Now, the bike! 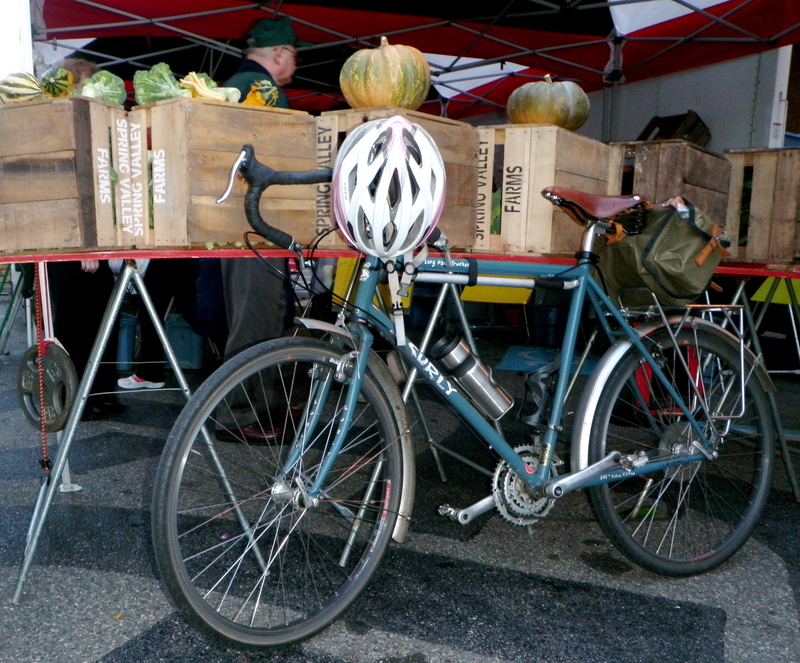 As I stepped in line to pay for my produce, I noticed that the person in front of me had a Rivendell Romulus. Excitement! I know there are a few Romulus commuters out there, including one person who I’ve seen with a set of Baggins panniers, but it’s not every day I see one stopped right in front of me. Sloan, the owner of the bike, had set up his Romulus with a Brooks cut-out saddle, toe clips (for commuting purposes, he said), and NO FENDERS. So bold and optimistic! I also believe that’s cork in the bar ends. Nice! I would have liked to take a few more pictures of the bike, but we were both maneuvering in a small space, the light was fading from the sky, and the flash can be distracting to others. I don’t want people to think I’m a totally weird bike paparazzo. Weekend, I hear you calling me. Where are the mailboxes? Have a great weekend, all! That’s excellent! And I like his Sugino cap, too!